It’s time to match up two of the most intelligent, powerful, and misunderstood dog breeds against each other. 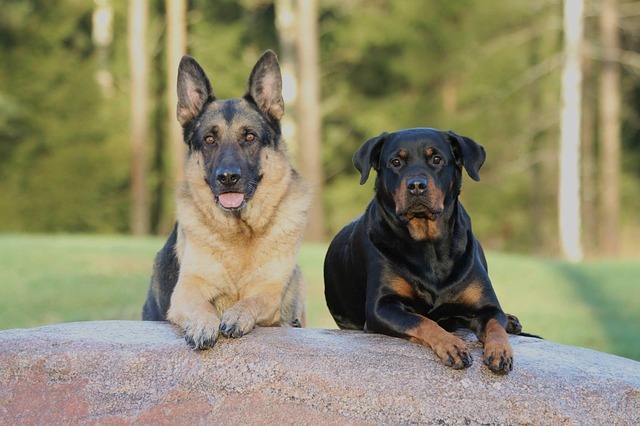 German Shepherds, and especially Rottweilers, have experienced unfavorable headlines in popular media. Despite the bad PR, you’re reading this article. Good for you. 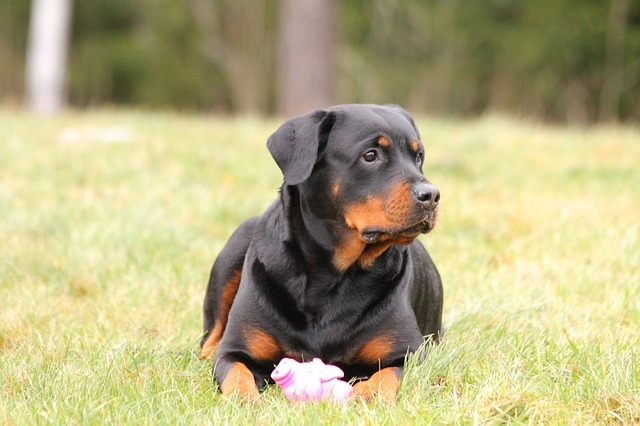 We’re going to go beyond the headlines, and dig into the real-world characteristics of both Rottweilers and German Shepherds. 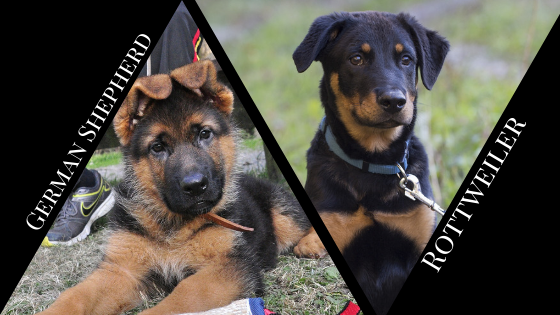 We’ll compare size, cost, intelligence, temperament, and maintenance of the German Shepherd vs Rottweiler to help you determine if either dog is right for your home. They originated in Germany, but today the German Shepherd is believed to be the 2nd most popular dog breed in the US, behind the Labrador Retriever. Especially in writing, they are often referred to with the acronym GSD (German shepherd dog). Adult GSDs will usually weigh in between 48 and 88 pounds, and grow between 22 and 24 inches tall. Originally bred as sheep dogs, German Shepherds have red/black or tan/black color. They typically sport a black mask and a black saddle on their backs. Most German Shepherds live around 10-13 years. Ask anyone who has worked with this breed. German Shepherd intelligence is among the best of any dog breed in the world. GSDs have an incredible ability to interpret instructions accurately, and learn tasks quickly. Their sense of smell is very strong. 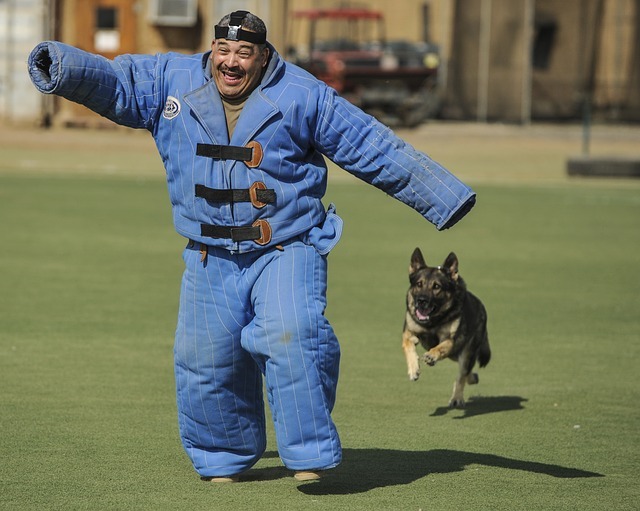 GSDs often find themselves working as police dogs, disability dogs, guard dogs, military dogs, and search and rescue dogs because of their extreme trainability. 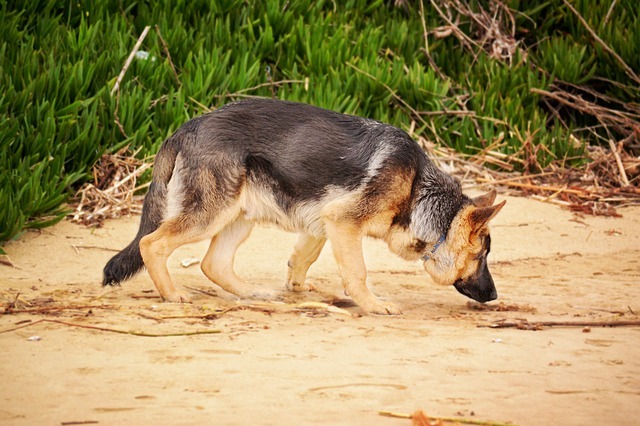 Germans Shepherds are typically cautious, and may not immediately welcome a stranger. Despite this, German Shepherds can make great in-home companions. They are very protective and athletic. The typical GSD will bark moderate to high amounts if allowed to bark freely. In fact, a German Shepherd holds 2nd place for the loudest bark ever recorded! Most well-trained GSDs are eager and alert, ready to immediately obey your next command. Need to stop dog barking? Check out the BarkBlaster for humane, automatic training with immediate results. Well-socialized German Shepherds are great family pets, but don’t provoke this breed to anger if you enjoy your life and a full set of limbs. They can bite down with more force than a pitbull! While German Shepherds are typically good with people, they can have difficulty socializing with other dogs. GSDs need frequent opportunities to burn off steam. If you don’t have time and space to run and play, pick a different breed for your home. Heavy shedding year round is the norm for a German Shepherd. Twice a year, they shed even more as they lose their undercoat. Later in life, German Shepherds may struggle with hip and elbow dysplasia, which can lead to arthritis. This breed is also somewhat prone to degenerative myopathy. 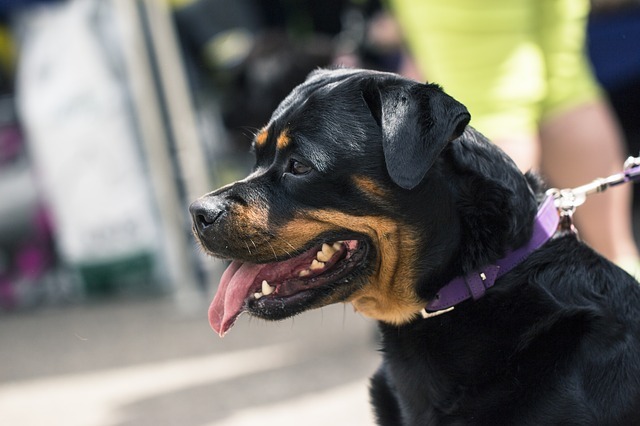 The Rottweiler originated in ancient Rome. They were bred to work and protect. Rottweilers first found themselves employed herding livestock, or pulling carts of butchered meat to market. The Rotty is is both intimidating and adorable. It’s a big dog, ranging anywhere from 70 to 130 pounds. Height is typically around 2 feet. They have a black coat with tan markings. With 328 pounds of biting force, they are a dog you don’t want on your bad side. You can expect Rottweilers to live about 8-10 years. Rottweilers are known to be very trainable and intelligent. Training should be structured and consistent for best results. These dogs were used in WWI and WWII. Today, they are often found employed in law enforcement settings. Rotties have the potential to be gentle giants, ruthless protectors, or both. It all comes back to how you sculpt the dog in training. Rottweilers are eager to serve, devoted, and obedient (if trained well). Their guarding instincts are strong, so the mean reputation of this breed is partially valid. Irresponsible ownership, neglect, or abuse of a Rottweiler will create an extremely dangerous animal. However, responsible ownership, early socialization, and early training will create a hard-working, friendly, committed animal that the whole family can enjoy. Don’t let headlines keep you from considering this dog. A Rottie’s diet and exercise should be watched closely, as this breed is prone to obesity. Frequent exercise is a must for this energetic dog. Rottweilers can have sensitive digestive tracts. Elbow dysplasia and osteochondrosis of the knee and shoulder are somewhat common. Rottweilers are more prone to eye malfunctions. This breed sheds heavily in the spring and fall, and continues shedding moderately during the rest of the year. There are a few more differences worth highlighting when comparing the German Shepherd vs Rottweiler. If you’re worried about shedding, the German Shepherd is going to shed more. Get you checkbooks ready. A well-bred Rottweiler can cost anywhere from $1500 – $2500. German Shepherds will cost around $500 – $1500. Make sure you’ve got plenty of room in the budget after the initial purchase, as both dogs will be expensive to maintain properly. Rottweilers, whether they deserve it or not, carry a rough reputation. Some areas have banned this breed. Should your dog ever get into trouble, the potential for a lawsuit is much higher simply because of reputation. Overall, these dog breeds are incredibly similar. The choice is yours! Both dogs require training and attention, but you won’t regret the results.